Vision of the Eagle is the third book in a quartet set in Oregon Territory. 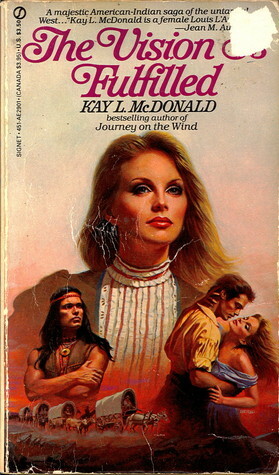 This review may be slightly spoilerish for those who haven't read the first two books, so consider yourself warned.This book picks up where Journey on the Wind left off - Marlette is headed west to join her husband Ross and he's on his way east to find his wife and once the reunion is over they prepare to head back to Oregon via wagon train. Although white, Ross was raised by the Sioux and his knowledge of the country and wilderness skills are invaluable to the rest of the group, although not everyone is too enamored of him. The band travels west, and face the usual hardships of life on the trail - Indians, dust, lack of food and water, long grassless plains and high mountain trails - but Ross manages to keep most of them together until they reach the Willamette Valley. I did like this book quite a bit better than the first two, despite a very lame plot twist without much reason except to cause some marital tension between Ross and Marlette - but events that happen in the latter third of this novel should have been left on the editor's cutting room floor. I won't spoil, but the ending was not exactly what I was expecting, and the events leading up to it were not only boring as all get-out, but again very contrived and just stuck in there to move Ross and the author's plans for him forward. While I understand the focus of these books is Ross and the vision he received when he was a young boy living with the Sioux, this ending was still too much, nor do I like the character who will focus with him in the last book. Rarely do I leave a series incomplete, but I believe I will be passing on that ride.Four stars for the book leading up to their arrival in the Willamette Valley, two stars for the ending. Bah! Without giving away the ending and what happens in the end of the book. What a great book and series. I really enjoy the entire series. I was sad to finish this book. Though I didn't like the ending as I loved the relationship between Ross and Marlette. McDonald does tie up the ending but not how I would have thought. I liked it better than the last one. Kay L. McDonald - Kay L. McDonald was born and raised in Salem, Oregon. She graduated from North Salem High School and Famous Writers School. She worked for Pacific NW Bell and Paradise Island Mobile Home Park. She married husband Norman L. McDonald in 1955 and has two children. She is a member of Western Writers of America, Women Writing The West and Authors Guild.